Members of the Belmont National Science Teachers Association (NSTA) participated in the Adventure Science Center’s Engineering Day on Saturday, February 24 and led demonstration for the guests around the theme “Chemical Engineering & Going Green.” The group described how sodium lauryl sulfate (SLS) found in some shampoos, detergents and cleaning substances can be toxic at high concentrations and how less toxic alternatives can be found. To do this, group leaders showed the “foamy” properties of SLS compared to the lemon water that they made, and then asked the children to make a hypothesis about which one would work better. They then let the participants choose which mess they wanted to clean up (options like syrup, honey, chocolate syrup, makeup and jelly) and allowed them to conduct their own experiment with lemon water while they cleaned with the SLS. Then they asked them if their results supported or disproved the hypothesis of which cleaned better. The NSTA members wanted to show that the lemon water cleaned just as well as the SLS and is healthier for users and the environment. 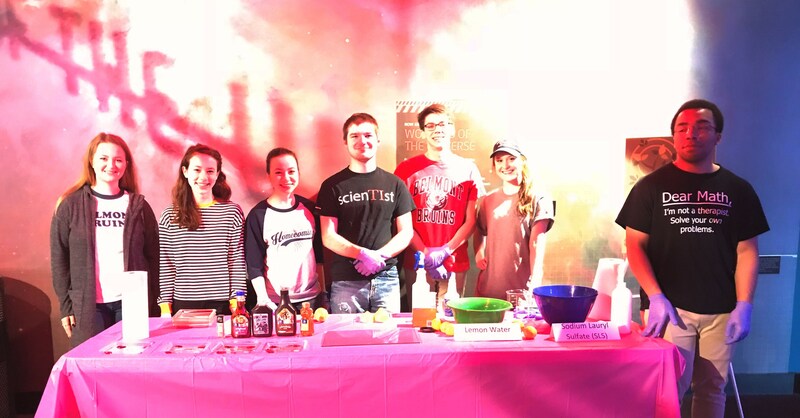 The NSTA members that helped with the demonstrations were Aaron Rice, Avery Daniels, Chris Burdette, Shannon Kelly, Rachel Hongo, Tori Hongo and Mary Barber.